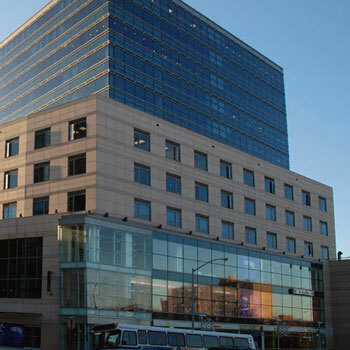 Queens Crossing is a retail and office complex located in the heart of Flushing's business district. The upper levels are home to businesses and medical offices, while the lower levels provide stores, restaurants, and a food court. Major retailers and local boutiques at Queens Crossing include Cooper Jewelers, Mango, Sisley/SKII, Mulan Restaurant, Rose House, Spring Shabu Shabu, and Paris Baguette. Also located at Queens Crossing are Shinhan Bank, TD Bank, and Long Island Business Institute. Underground valet parking is available to visitors and tenants of Queens Crossing. The valet parking entrance is conveniently located on 38th Ave between Flushing Main and 138th streets.